On August 30, 2012, Valladolid became part of the Pueblo Mágico El Programa Pueblos Mágicos (“Magical Villages Programme”) which is an initiative led by the Mexican tourism dept.to display influential towns in Mexico based on their natural beauty, cultural riches, or historical relevance to the country. Valladolid is a great city to spend the day exploring the history and culture the Yucatan peninsula has to offer. From colonial era churches and architecture to natural wonders like cenote notable sights to visit in Valladolid are the colonial era cathedral Ex-convent and church Convent of San Bernardino de Siena named after saint Bernardino of siena in whom was built by Franciscan missionaries between 1552 and 1560. Located in the Sisal neighbourhood and a short 10 minute walk from downtown it also has a wonderful park where you can sit and enjoy tranquility and peacefulness. In downtown Valladolid, you can find the cathedral of San Servacio located in the main square of the city. Valladolid has a chessboard-like street grid and at the city center it’s a plaza with a park square in the middle surrounded by stores where you can enjoy a walk and purchase souvenirs, food or refreshments. 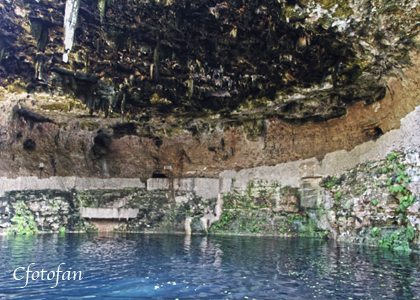 Located a couple of blocks from the heart of the city is the Cenote Zaci, a landscaped freshwater cenote or underground sinkhole in which you can access the inside and explore its cave. There is also a restaurant in the premises of the Cenote Zaci and artesants selling their handcraft. Valladolid is a popular base for visiting nearby major Mayan ruins such as Chichen Itza and Ek’ Balam as well as Cenote Ik Kilso keep in mind when visiting the peninsula. This entry was posted in culture, gallery, Images, photos, travel and tourism and tagged cenotes, mayas, México, underwater-skinholes, Yucatán. Bookmark the permalink. ← Parque Juárez on the Day of the Dead, San Miguel de Allende, México.